Like much of his work, John Leguizamo’s sixth play deals with a father-son relationship — only this time, he’s the dad. 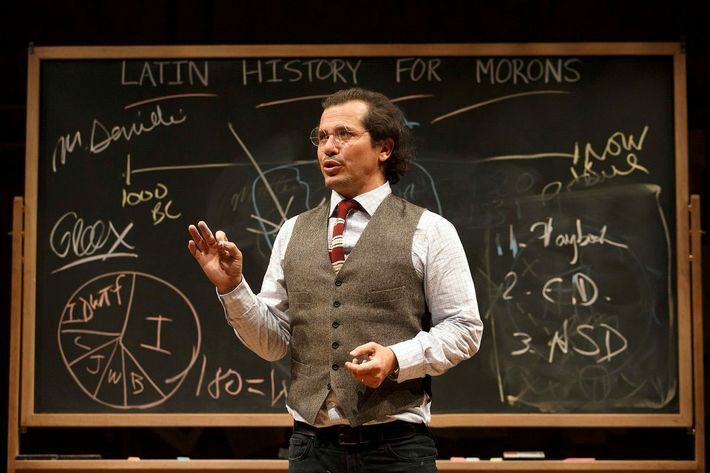 Leguizamo, 52, is himself the father of two, and it’s his son, Lucas, who becomes the focal point of Latin History for Morons — opening today at the Public Theater — when a classmate calls him a racial slur. The actor and playwright penned his theater debut — the one-man show Mambo Mouth — when he was just 24. It was the early ’90s, and Leguizamo started writing because he was tired of the small and offensive roles he kept receiving. His career has reflected that resistance: He’s toggled between Hollywood blockbusters, big campy roles like To Wong Foo, and one-man shows like Freak, his brilliant semi-autobiographical play that fused genres to create a new form of storytelling. Leguizamo spoke to Vulture on the phone in between performances of Latin History to discuss American racism, playing too many “Janitor No. 3” roles, and why his wife edits everything he writes. After I watched Latin History for Morons, I thought about James Baldwin’s The Fire Next Time, which was the letter/essay that he wrote to his nephew. Oh my god, it’s so beautiful. You know, of course I’ve read a lot of James Baldwin but I hadn’t read that piece until somebody told me, You know, it’s just like that one essay. It gave me confidence to continue, because no matter what you write, there’s some place in the process where you lose confidence. I think every playwright does. So at those points, reading that was really powerful. And, you know, all the literature that I’ve been reading. Eduardo Galeano’s book Open Veins of Latin America, one of the great pieces of literature in understanding Latin American people and our history and our passion and our problems. It’s such a masterpiece. So all these things motivated me. Obviously, the start of this whole thing was the fact that it was so hard to believe that my son is bullied at school with racist monikers. It was just shocking to me. And the fact that they couldn’t stop it. I wanted my son and my daughter to feel incredibly proud of their heritage so nobody could rob them of that dignity. That’s what we’re seeing right now on a national level — racist bullying. Absolutely. In all the research I’ve done, it’s not the first time. When I read about the Repatriation Act in the 1930s where, right after the Depression, they hunted Latin people by their Spanish surnames in the Southwest — even if they were American citizens for generations and generations — and took their homes, their land, and removed them — 500,000 people. I mean, there are just a lot of slights against Latin people that need to stop. And this whole immigration thing is really destructive because it motivates hate crimes. Latin people now have 60 percent of hate crimes perpetrated against them; we’re the highest minority right now. What is going on? It’s so hateful. This country was founded by Latin people — the first United States were actually by Latin people, the first cities were by Latin people. We didn’t just get here. And the migration that happens from the South to the United States was something that naturally happened because Latin people are mostly Native-American anyway. You see those people being rounded up by ICE, and you look at pictures of Native-Americans being rounded up in the late 1800s. They look exactly the same except for the clothing.